An up-close look at the legendary band of Crusaders. Jones (Magna Carta: The Birth of Liberty, 2015, etc.) examines the storied Templars, an organization of quasi-monastic warriors who rose to fame and power in the midst of the Crusades only to rapidly collapse in questionable scandals. The author realizes that the allure of the Templars, then and now, is related to their otherworldly ideal. “In a sense,” he writes, “the Order had always existed in two spheres, the real and the imaginary.” The Templars uniquely combined the rigid discipline of a monastic order with the seemingly secular profession of soldier. This unusual pairing, along with the epic backdrop of the Crusades, made them popular among their contemporaries and has kept them in the public imagination since. Starting in 1119 as a band of soldiers committed to protecting Christian pilgrims visiting the Holy Land, the Templars soon received the spiritual patronage of 12th-century divine Bernard of Clairvaux. Bernard wrote the “rule” by which the Templars were to live and work and advocated for them with the powers that be. The Templars would go on to achieve great fame and eventually become very wealthy landowners. Late in the century, the armies of Saladin would decimate them and reverse their achievements; however, the order would live on and rise to prominence again. Early in the 14th century, Templar leaders were, rightly or wrongly, accused of heresy and many were imprisoned or put to death, putting an end to the order and, most importantly, to its power. Jones provides a meaty, well-researched history replete with primary source quotes. Organized in four distinct parts, the narrative clearly lays out the story of the Templars and their changing fortunes. Though steeped in the facts of medieval history, the book presents as accessible to general readers. 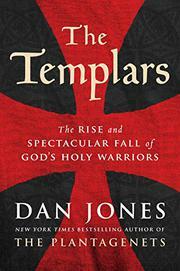 An exceptional introduction to the Templars.